Edgar Lloyd was born in Lewisham on 31st July 1886. 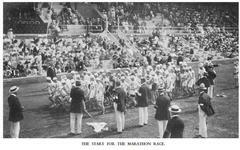 He competed in the Men's Marathon in the 1912 Stockholm Olympics where he came 25th in a time of 3 hrs 9 mins 25 seconds. In 1913 he competed in a track race organised by Finchley Harriers at Stamford Bridge, where he set new British records for every distance from 41 to 50 miles. He died on 3rd January 1972.